A few months ago I wrote a review of the BAZAR ‘Arizona’ house. It’s proved to be a really popular entry on the blog of which I’m quite proud, not because I wrote it, but because I honestly believe the house and its components to be amongst of the best dwellings available on the grid. The shine hasn’t faded since my initial review either. Each time I log in I’m taken aback by how much I adore my Arizona home. The design and texture elements of the house are stunning, but the furniture is just as important as the structure and plays a vital role in bringing the build to life. 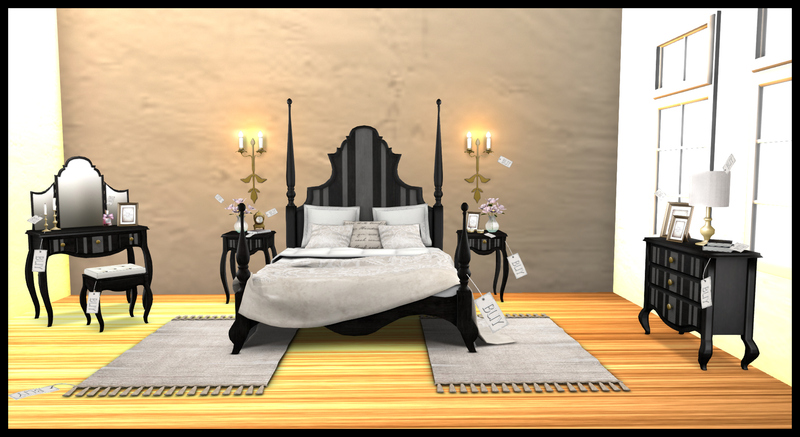 Fortunately, the creator Ria Bazar-Mavendorf is just as talented a furniture designer as she is architect, so imagine how delighted I was to log-on and discover her latest bedroom release. Ria’s Floria bedroom incorporates mesh and as a consequence of this manages to retain an ornate look without causing a detrimental land-impact. The name is inspired I’m sure by the romantic lines and the tones of the set. There’s a hint of classical French boudoir styling to it, yet it remains contemporary enough to make it capable of working in both modern homes as well as some of the grander mansions you’ll discover in certain corners of the grid. The centerpiece is the stunning bed. It’s utterly resplendent, featuring a large headboard and beautiful turned columns at each corner. It oozes style and has a traditional feel, but what I really adore is the fact that you can change both the colour of the bed as well as the bedding; meaning that you can mix and match your bedroom to suit every mood. How about black wood with red bedding for a sensual night with your loved one, or light wood and crisp, champagne coloured sheets for a Sunday morning lie-in? The options are endless and there are plenty to choose from. You’ll find dark and light wood, as well as solid black, blue, pink and white, and also contemporary striped stylings included. It’s really entertaining trying out all the different combinations that are available. The colour change facility applies to the matching bedside tables, vanity and dresser. I love that with a click of a button on a menu you can have an instant brand new look for your room, making Floria a substantial purchase that will provide you with months of wear. Of course, this being a Bazar bedroom it features some fantastic menu options. If you thought the furniture styling was good, then you are going to be spoiled by the animation and prop options for the bed. You can hang out with friends, or be alone, or use some of the naughtier poses in the adult section of the menu. (Option only available when purchasing the Adult version of the bed) I must say that the couples animations are exemplary on this bed. These kind of options are not something that I tend to bother with (usually because I find them a bit cheesy, and also because Jez is never ruddy well in-world when I’m feeling lonesome) but these are very nice because they offer more sensual poses than some currently widely used on the grid. You can rez props too. I’m not going to tell you about all of them, as I believe that this is something you should experience yourself and I don’t want to spoil the surprise, but I do love that you can rez a breakfast tray and laptop among other props. The poses (when used in conjunction with the props) are all sensational. 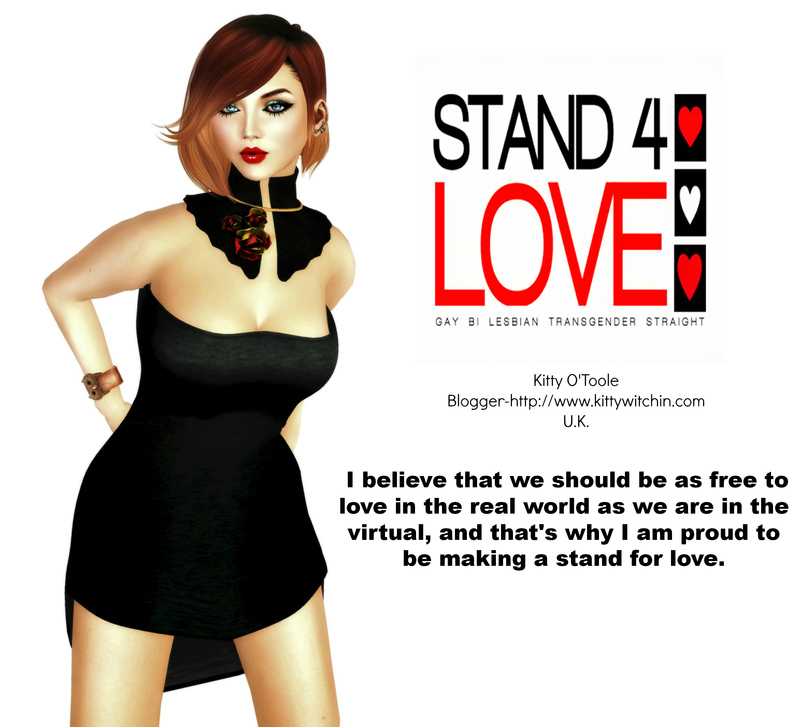 Each one is well animated and genuinely adds a huge touch of realism to your Second Life. You know, I can’t think of anything nicer than spending a day in world on this bed! From breakfast in the morning, to snuggling down under the covers at night, everything is included. Move on to the coordinating furniture and you’ll find that this is just as well thought out as the bed. 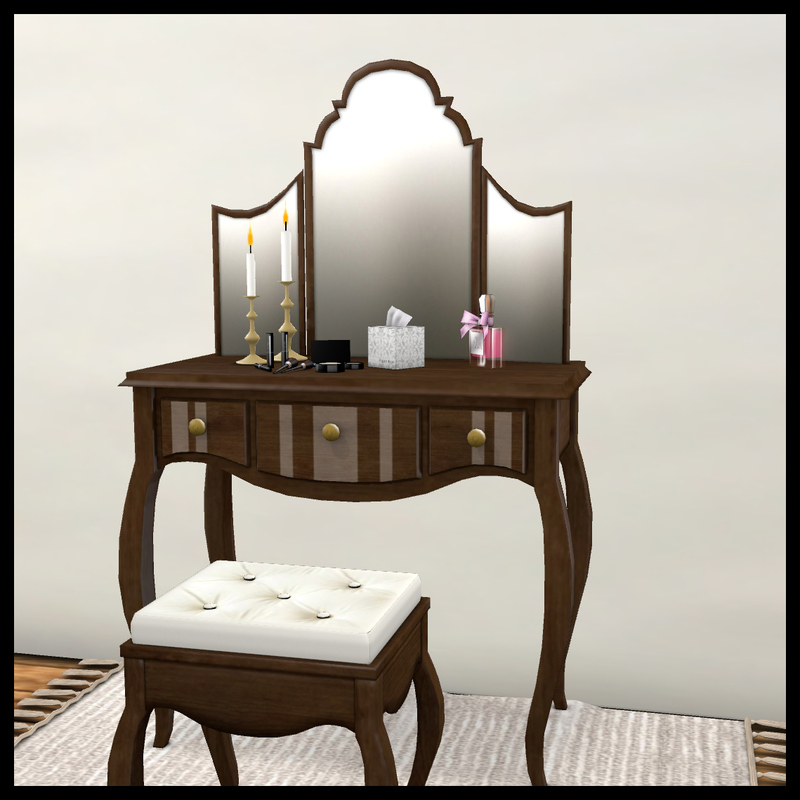 Take the vanity (dressing table) for example. An elegant compliment to the bed and side tables, but again blessed by thoughtful touches from Ria. You can rez manicure items, moisturisers or a selection of make-up to decorate the table top. By sitting on the accompanying stool you can activate animations to match, meaning that you can paint your nails, apply lipstick and so on. The option of rezzing items on a whim is a real blessing and again, adds a real touch of authenticity to the room. It’s so much fun! The final component is the dresser. Three virtual drawers of happy ready for adorning with some of the decorative items that come with this set, which include picture frames, books, candlesticks, an antique clock, a vase of flowers and tea-lights. Items are copy so you can rez as many as you need, and I find that this set blends really well with items that I have from other quality content creators in-world. The finishing touch are the wall sconces, and the matching lamp. You can of course turn these on and off, but for extra ambiance you can choose the colour of the lighting, perfect for enhancing your mood. Yet another touch of quality from Ria’s expert hand. The Floria bedroom pieces enable you to create a truly beautiful and relaxing environment. I find it interesting that I love this style as much as I do because I’m usually attracted to more modern designs, but Floria has such a broad appeal that I found it hard to resist. Kudos to Ria for creating a bedroom that spans the gap between classical and modern so perfectly. I’m pretty sure that you will love it just as much as I do. Bedroom is available in PG and Adult variations. PG costs L$605, Adult costs L$655. Total LI (Land Impact) of set as is: 33. All items mentioned above are available separately in-world. To see the set in Second Life, click HERE.